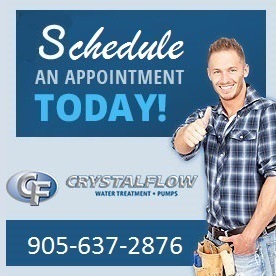 Crystalflow is a licensed well contractor in Ontario with the Ministry of Environment. (MOE) We specialize in the the installation and service of residential and commercial well pumps. We also install pumps for larger recreational water systems. The Standard Schaefer Legend 4″ submersible pump features the new TRI-SEAL floating stage system. This new stage system improves efficiency and protects against wear when pumping abrasives (sand). The SQE is the only pump on the market fully equipped with built-in electronic controls which allow for advanced computer controlled performance and state of the art protection features including sophisticated diagnostics.